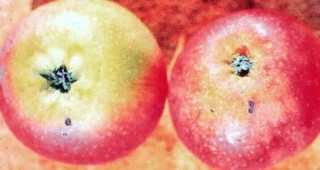 The names X-spot, X-rot, and Nigrospora spot have been applied to a small, circular, depressed, necrotic spot typically on the calyx end of apple fruit in the mid-Atlantic region (Fig. 1). Although uncommon, incidence of X-spot as high as 86% was reported on unprotected 'Golden Delicious' and 'Rome Beauty' fruit in 1950. Other susceptible cultivars include 'Jonathan', 'Stayman Winesap', and 'York Imperial'. Figure 1. X-spot is likely a fungal disease, although the pathogen is undetermined at this time. Photo: A. B. Groves, Virginia Tech. A fungus has been associated with X-spot lesions, but the typical lesion symptom has not been duplicated by controlled inoculation, and the disease cycle has not been resolved. Fungicides applied for summer diseases provide effective control of X-spot. Original text prepared by K.S. Yoder. The original version of this article appeared in The Mid-Atlantic Orchard Monitoring Guide (NRAES-75) and is reproduced with permission from the Natural Resource, Agriculture, and Engineering Service, Cooperative Extension, 152 Riley-Robb Hall, Ithaca, New York 14853-5701, U.S.A. (607) 255-7654. It has been edited for presentation here by Alan R. Biggs, West Virginia University.